Featuring Two Miami Art Stars. 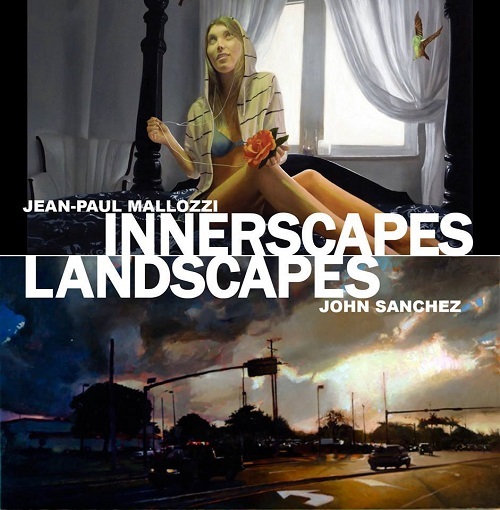 Sirona Fine Art presents the coveted works of Miami-based artists Jean-Paul Mallozzi and John Sanchez. This highly anticipated show reveals the dream-like narratives of Mallozzi’s figurative works and the depths of Sanchez’ mesmerizing slice-of-life landscapes. Miami Art Scene™ announces Sirona Fine Art’s high profile art exhibition ‘Innerscapes and Landscapes’, from Saturday, April 11 – Sunday, May 10, 2015 in the heart of The Village at Gulfstream Park. The show presents a sublime exhibit featuring the works of highly sought after Miami-based artists Jean-Paul Mallozzi and John Sanchez. The Opening Reception takes place from 6-9pmon Saturday, April 11th. Jean-Paul Mallozzi was born and raised in Queens NYC, and received a scholarship to attend the Rhode Island School of Design (RISD). He graduated with B.F.A in Illustration. His works have been exhibited in galleries and museums nationally and internationally including Los Angeles, New York, and London. Jean-Paul’s work balances the fine line of combining highly rendered figures with expressionistic bursts of energy. Mallozzi creates psychological portraits, with symbolic colors and vibrations that physically resonate from within his subjects to reveal some deeper essence. The incorporation of iridescent pigments and animal familiars take the figures out of the mundane and into a world where the veil between realities is pulled away. His work is included in the art collections of high profile people such as actress Anne Hathaway and Adam Shulman, and the Director of the Long Beach Museum of Art, Ron Nelson. John Sanchez was born in Passaic, NJ and grew up in the blue-collar town of North Bergen, New Jersey. His background informs the humanist realism he brings to his work. Sanchez blends traditional painting techniques with a contemporary subject matter, creating paintings of seemingly unremarkable moments that, when bathed with the atmospheric drama of light, dark and brilliant color becomes something more. Sanchez attributes the bulk of his training from the prestigious Arts Student’s League of New York and is a graduate of Miami International University of Art & Design, and holds a Masters of Fine Art degree from Florida International University. His work has caught the attention of collectors including Debra and Dennis Scholl, Bill Bilowit and Grela Orihuela and Tom and Trish Kennedy. He is also in the permanent collection of the Perez Art Museum in Miami, theFrost Art Museum at FIU, as well as having an international following. He lives and works in South Florida. “The art of Jean-Paul Mallozzi and John Sanchez embody so much of what I was looking for in this new gallery: Florida-based artists who have classically solid talents, while at the same time being contemporarily relevant with distinctive visions.”, saidTimothy Smith, Gallery Director of Sirona Fine Art. Sirona Fine Art is a grand showcase located at 600 Silks Run #1240 at The Village at Gulfstream Park in Hallandale Beach, Florida 33009. The gallery is ideal for artists who embrace academic structure and technique, yet have an understanding and facility within the modernist landscape in which their work is viewed. Art can appeal to the senses, the emotions and the intellect equally or separately, as long as it connects. Creators who skillfully present their ideas and personalities, constructed with a masterly hand, these are the artists Sirona Fine Art represent.